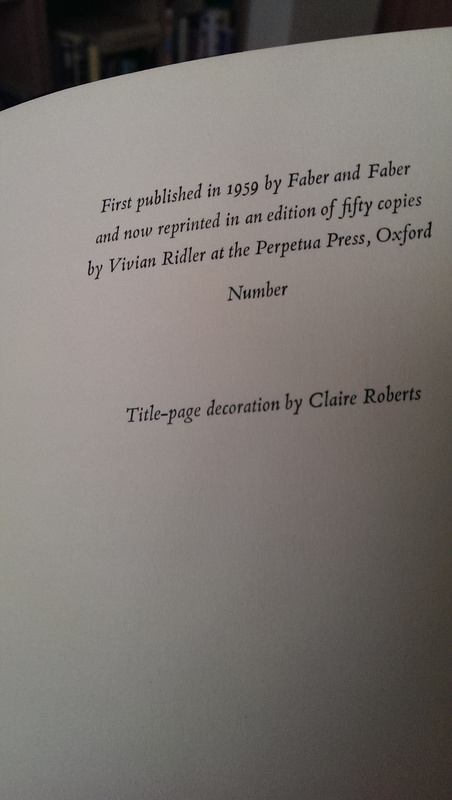 Vivian Ridler (October 1913–11 January 2009), was a printer, typographer and scholar in Britain. He was Printer to the University of Oxford at Oxford University Press from 1958 until his retirement in 1978 ; and also established his own Perpetua Press. 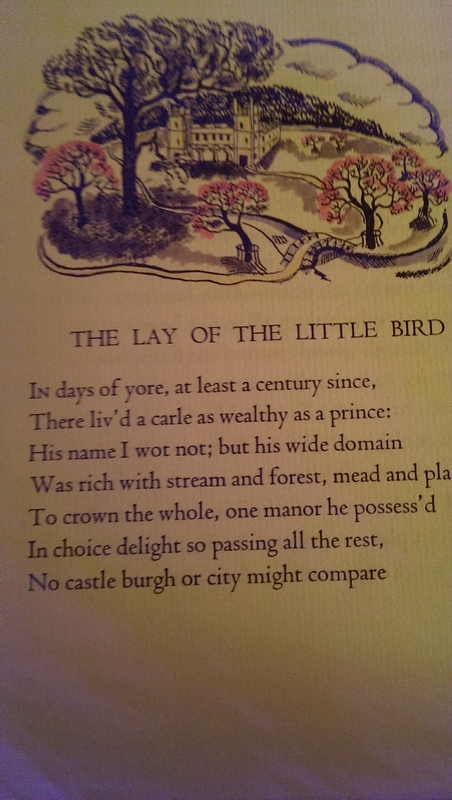 Work is a model of typographic design, included original work, not least that of his wife, the poet Anne Ridler. 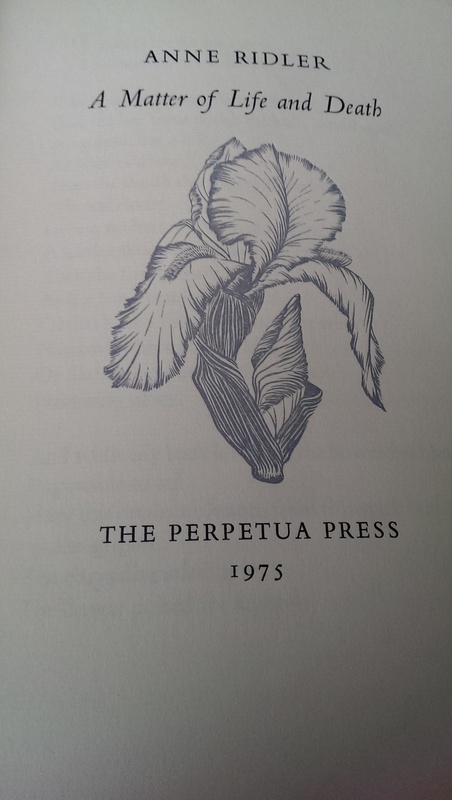 The Perpetua Press was the private press of Vivian Ridler. It operated 1933-1937 and then was revived from 1966, remaining very much his private press until 1978, later enlarging its brief and coming under the wing of Hugo Brunner to 1988. Coloured frontis, and illust, 9pp, short tear to the original paper wraps, frontis signed in pencil by the illustrator. 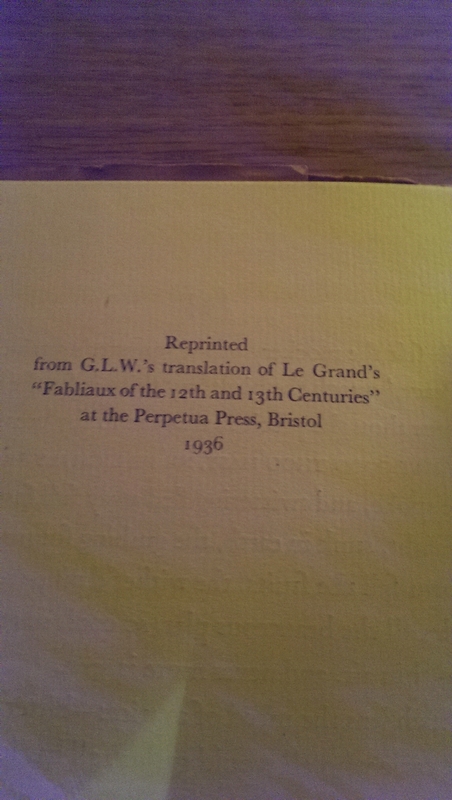 Reprinted from G.L.W.’s translation of Le Grand’s “Fabliaux of the 12th and 13th Centuries”. 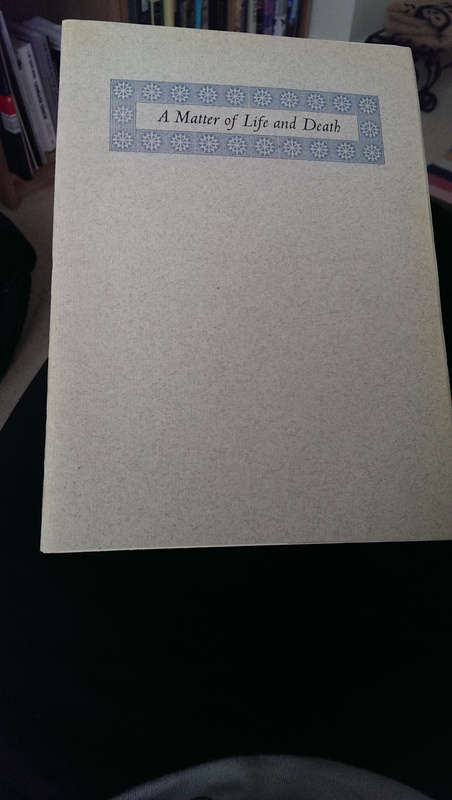 Book Description: Wrappers. Covers very slightly darkened at spine. 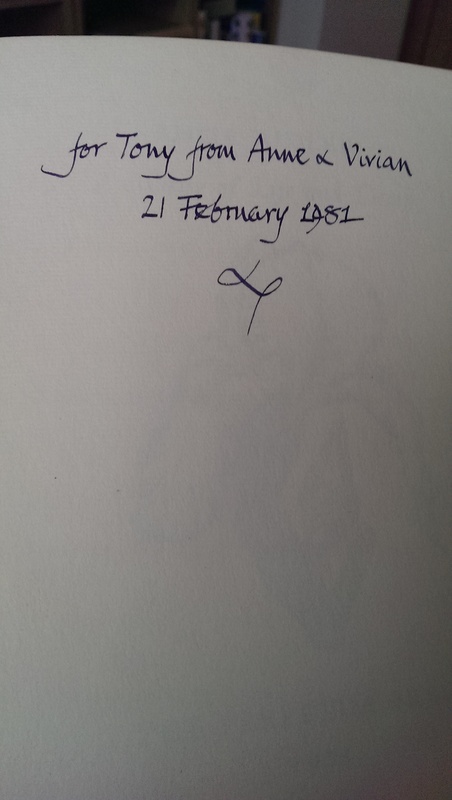 Edition limited to 50 numbered copies, this copy unnumbered but inscribed by the author to Anthony Astbury, founder of the Greville Press, “for Tony from Anne & Vivian 21 February 1981”; printed by Vivian Ridler. 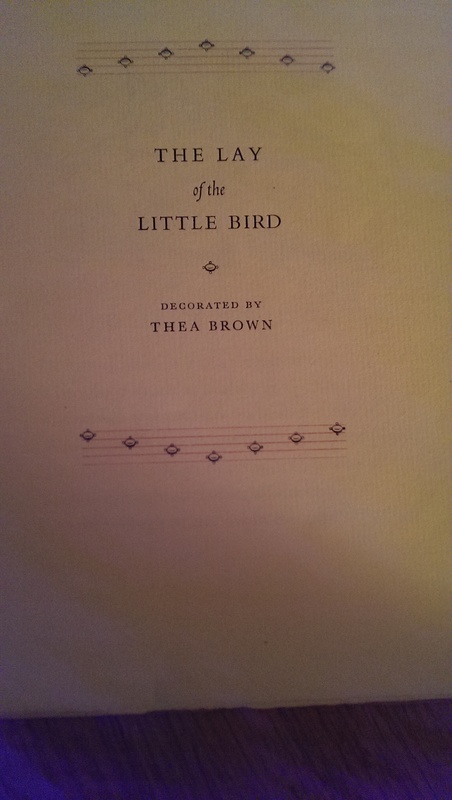 Modest little pamphlet, pristine condition, nicely produced especially the illustration on title page. 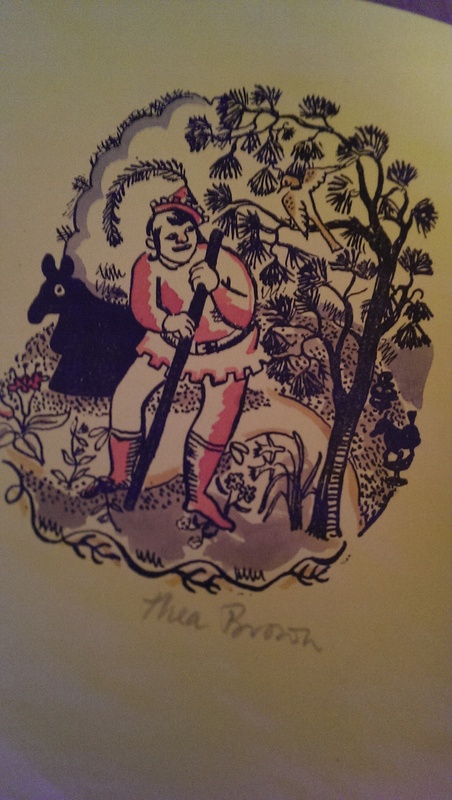 Anne Barbara Ridler OBE (née Bradby) (30 July 1912 – 15 October 2001) was a British poet, and Faber and Faber editor, selecting the Faber A Little Book of Modern Verse with T. S. Eliot (1941). 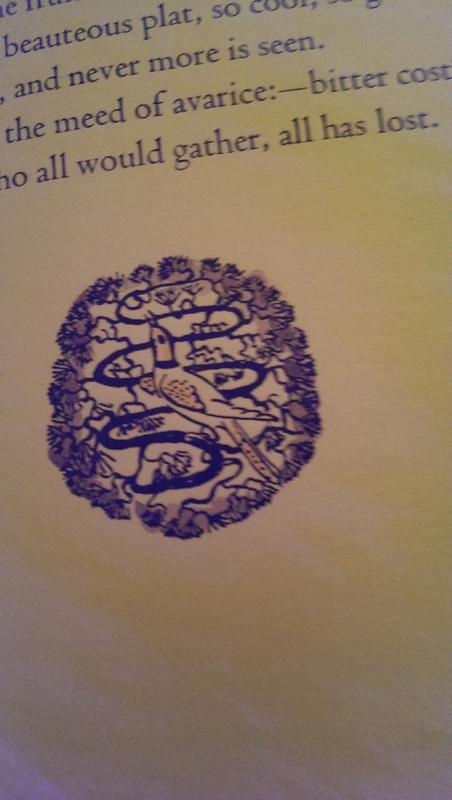 Her Collected Poems (Carcanet Press) were published in 1994. She turned to libretto work and verse plays; it was later in life that she earned official recognition.